Somehow, for me, Jacob’s Ladder has always gone hand-in-hand with Angel Heart (1987). Maybe director Adrian Lyne and writer Bruce Joel Rubin were heavily influenced by Alan Parker’s masterpiece? It would not surprise me at all. No matter, Jacob’s Ladder can stand tall all by itself as an exceptional cinematic experience. This nerve-wracking psychological mystery thriller will bewilder and horrify you in a most gratifying manner. The only alleviation you will get during all the madness and despair is if you press the Pause button. Tim Robbins delivers an intensely unsettling performance alongside stalwart co-actors Elizabeth Peña, Danny Aiello, Matt Craven, Pruitt Taylor Vince, Jason Alexander, and a string of other names that have since hit the big time. If you like to be thrilled – and you like to use your brain – then this cult classic from the 90s is for you! You can find more information on this American movie on Wikipedia and IMDb. 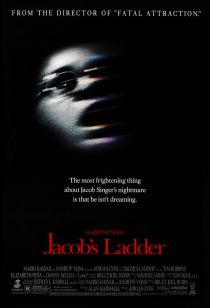 Unsettling certainly is the right word for Jacob’s Ladder, a blaze of creepy peculiarities! Great review. I love your logo, Adam; very cool. And the writing on your site is incredibly insightful. Hopefully one day I’ll enjoy that depth of understanding! Thanks mate, i really appreciate that! Thoroughly enjoy your top writing too! Yes, it’s a keeper, Daniel! One of my absolute favorite films. For me, it goes hand-in-hand with Flatliners. I never could get into Flatliners. I’ve tried a couple of times; when it first came out and again last year. Ah well; you win some, you lose some! Louis: Eckhart saw Hell too. He said: The only thing that burns in Hell is the part of you that won’t let go of life, your memories, your attachments. They burn them all away. But they’re not punishing you, he said. They’re freeing your soul. So, if you’re frightened of dying and… and you’re holding on, you’ll see devils tearing your life away. But if you’ve made your peace, then the devils are really angels, freeing you from the earth. Powerful quote from one if my favorite films of all time. Superb writing. Thanks for sharing that, Joe! This film freaked me out when I first saw it. So I watched it again a few days later. Remember watching it when it first came out. It was a good movie and I think probably the first one I ever saw Tim Robbins in. Hi Bun. I think the first film I saw Tim Robbins in was Short Cuts (1993) – excellent movie!